Influence on David Alfaro Siqueiros’ career began in his early years. Born in 1896 he lived in Chihuahua, Mexico with his family. In 1907 his family moved to Mexico City where he was exposed to political ideas that framed the person he was to become. At the age of eighteen while attending the School of Fine Arts, Siqueiros joined Veustiano Carranza’s Constitutional Army to fight the Huerta Government. The Huerta Government began in 1913 when Victoriano Huerta became president of Mexico. Many Hispanics saw Huerta as someone in violation of the Constitution of Mexico though, and in March of 1913 politician Venustiano Carranza called for a declaration of war between himself and Huerta’s party. Even though Huerta was defeated in 1914, Siqueiros was part of the Constitutional Army when they fought against Pancho Villa and Emiliano Zapata for political control of Mexico. The good part about traveling with the army is that he was able to see different parts of the country and various parts of culture he wouldn’t have seen before. In 1919, Siqueiros traveled to France and picked up other forms of art, meeting influential figures such as Paul Cezanne and Diego Rivera. Three years later in 1922 Siqueiros returned to Mexico City and began to paint again as a muralist for Alvaro Obregón’s revolutionary government. He also joined the mission José Vasconcelos, Secretary of Public Education, to educate the masses through public art. Siqueiros came to the conclusion that the art wasn’t nearly as prominent as it could be, so in 1923 he went on to help found the Syndicare of Revolutionary Mexican Painters, Sculptors and Engravers. Also 1923 brought Mexico Burial of a Worker, which still remains as a famous mural today. The Syndicate of Revolutionary Mexican Painters, Sculptors and Engravers also played a hand in publishing a union paper, El Machete. While El Machete spread the word about the problems Mexican artists faced about widespread public access, it also brought on its on problems among the members of the union, ending with Siqueiros being let go from his post under the Department of Education and being jailed and exiled in the early 1930s. The 1930s is when Siqueiros’ career really launched. He produced a series of political-themed lithographs, one of which was shown at the 1930 exhibition entitled Rectifications on Mexican Muralism at the Delphic Studios in New York City. Check out the picture below. In 1932 not only did he lead an exhibition and conference called “Rectifications on Mexican Muralism” in Taxco, Mexico, but he also participated in the Weyhe Gallery’s “Mexican Graphic Art” exhibition in New York. He also completed the Tropical America mural at the Italian Hall at Olvera Street in Los Angeles in this same year. The creation of this mural was the pinnacle for Siqueiros developing a new mural technique that would be accessible from multiple angles. The technique involved tracing figures with an electric projector onto a wall, photographing early wall sketches to improve perspective and adding in new paints and tools to weather the conditions. In 1936 Siqueiros was the guest of honor at the Contemporary Arts exhibition at the St. Regis gallery in New York. That same year he also ran a political art workshop in preparation for the General Strike for Peace and May Day Parade. Other famous works of Siqueiros’ that emerged from the 1930s include Echo of a Scream and The Sob. He returned to Mexico City in 1938 after spending time in the Republican Army in Spain. This same year, Siqueiros designed Portrait of the Bourgeoisie, a mural depicting capitalism and fascism as the enemy of the labor worker. This mural was never finished though due to his involvement with the army. He went from being forced into hiding to jailed for an assassination attempt on Leon Trotsky (the founder of the Red Army). Siqueiros led an attack on Trotsky’s house, assuming that by the time it was all said and done the man would be dead. Instead, Trotsky was killed by someone else, and police found their way back to Siqueiros. These events lead up to his exile in Mexico City. In 1950, Siqueiros participated in the first ever Mexican contingent with other famous Mexican artists, and he received the second prize for all exhibitors attending the XXV Venice Biennale exhibition. The prize was a physical recognition of the international status of Mexican art. 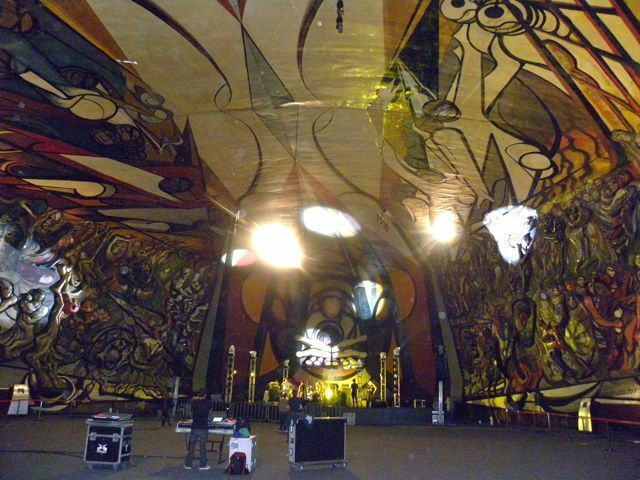 Siqueiros continued painting murals throughout the 1950s including The People to the University, the University to the People and Del porfirismo a la Revolucion. He also created For the Social Welfare of all Mexicans, Man the Master and Not the Slave of Technology and The Apology for the Future Victory of Science over Cancer. It’s important to note that all of these murals were painted on commission instead of for private patrons. Protests led by Siqueiros and attacks on the President of Mexico led to the artist being arrested and jailed in 1960 for four years. He didn’t stop working though even when he was imprisoned, and when he was finally freed he went right back to finishing up the murals he had started. Siqueiros completed his last project, a mural, in 1971. This mural is the largest ever painted, consisting of 12 panels of sculpture and painting. The mural is entitled The March of Humanity on Earth and Toward the Cosmos. Siqueiros was actually designing the sketches for this mural while he was jailed, and when he was released he brought together a whole team of artists to complete it. Overall, Siqueiros’ style was revolutionary; literally. A lot of his murals and portraits he painted in his lifetime were of the Mexican revolution. He wanted to spread messages and allow everyone to see what he believed about the Mexican heritage and the struggles his people were going through to overcome oppression and capitalism. Siqueiros left this life in 1977, but his art is still prominent in various parts of the United States and Mexico. Recently in the end of the year 2010, one of Siqueiros’ murals created in 1933, Ejercicio Plastico (Plastic Exercise) was inaugurated in Buenos Aires near the presidential palace. Take a look at it below, along with some other works created by Siqueiros. His work speaks for himself and proves how inspirational his art work really is to the Latino community. "The March of Humanity on Earth and Toward the Cosmos"
"Man the Master and Not the Slave of Technology"